The Kizil Köşk is a small Seljuk pleasure pavilion, probably used in the summer to escape the heat and enjoy the countryside. It is located about 15km from the center of Kayseri, in the Billur Garden district, on the road leading to Mount Erciyes. It is situated on the northwest section of a hilltop, and offers a panoramic view over the city. This hilltop setting recalls that of the Hizir Ilyas Kiosk. The construction date is unknown, but it is mentioned in the foundation (vakif) charter of Giyaseddin Keyhüsrev II, written in 1246. This vakif charter is particularly important because it was co-signed by Seyyid Burhaneddin and his pupil Mevlana Celaleddin Rumi. The kiosk is currently in ruins, with only 1 iwan still standing. The northern part of the walls extend outwards to form a sort of terrace. The plan comprises 4 interconnected barrel-vaulted iwans set in a quadrant pattern. As this was a modest private pleasure pavilion, there is no inscription plaque. There is no remaining decoration, although shards of turquoise ceramics found nearby could have possibly been original to the building. 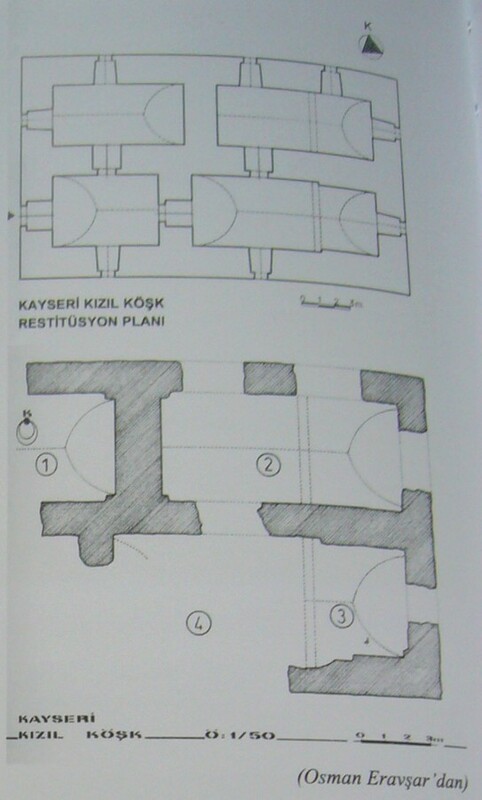 This han has been excavated by Dr. Osman Eravşar, who has reconstructed the plan as shown below. For more information, see Ozbek, Doç Dr. Yildiray and Yrd. Doç. Dr. Celil Arslan, Kayseri Taşinmaz Kültür Varliklari Envanteri, Kayseri Büyükşehir Belediyesi, 2008, vol. 3, pp. 708-711. Photographs taken in August 2009. 2001-2019, Katharine Branning; All Rights Reserved. No part of this site may be reproduced in any form without written consent from the author.